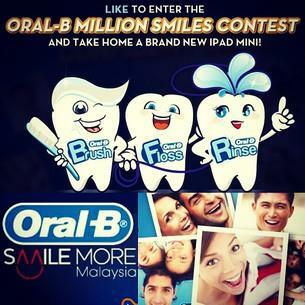 Home » iPad mini » Oral-B Million Smiles Contest : Show Off Your Smiles & Win an iPad Mini! Oral-B Million Smiles Contest : Show Off Your Smiles & Win an iPad Mini! Visit Oral-B Malaysia's "Million Smiles" Facebook page application. Register your details and complete all the information requested by the Contest App for entry into this Contest, including full name (as per NRIC), telephone number, date of birth and email address. Submit at least one "Most Confident Smile Photo" ("Photo Entry") by uploading it via the Contest App which must feature the most confident smile of the Participant and at least one of his/her family members and/or friends. Visit Oral-B Million Smiles Contest page for more details.